1. What are Cakettes? Cakettes are cake balls, but like you've never seen before! 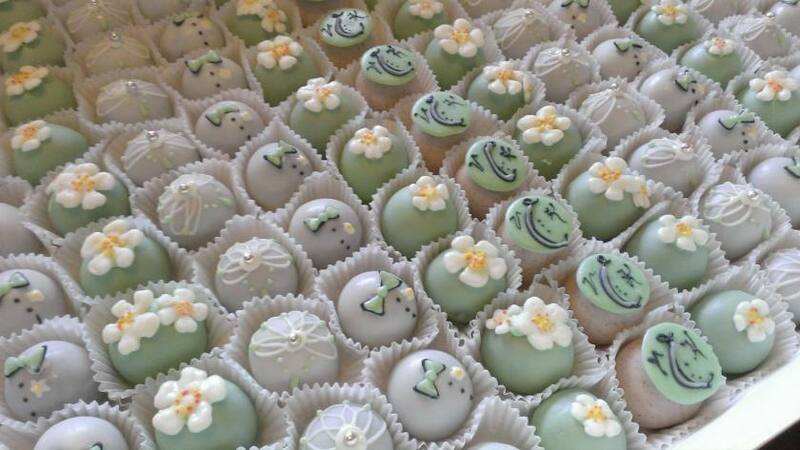 Commercially prepared cake balls are often hastily dunked or clumsily drizzled, but Cakettes are exquisitely hand decorated for each unique occasion. We offer dozens of fun and fancy flavors (though the favorite always seems to be Red Velvet) which rotate seasonally, and we're always experimenting to find new ways to bring out the best in cake! Visit us! We are located at 2009 W Hebron Parkway in Carrollton, TX. You may also order Cakettes by contacting Tessa at CakettesTX@gmail.com or through the facebook page, www.facebook.com/CakettesTX. There you can discuss payment, pickup and decoration one-on-one. Order Online! We are now offering delivery in the North Dallas area through our online store! Our store is also configured for in store pickup if you prefer. 3. Are Cakettes Gluten Free? Vegan? What about other allergens? We do not currently offer Gluten Free or Vegan options. All Cakettes contain wheat, as well as dairy, soy and eggs. While not all Cakettes contain nuts, both ground and tree nuts are used in the environment. Please contact us directly with any questions or specific dietary information. 4. How about wedding cakes? Or favors? Cakettes make a great favor at weddings, birthday parties, anniversary celebrations and more! We offer two piece wedding theme favors starting at $4.25 each. Final price will be subject to quantity, flavor, decoration and delivery. We do not do full size cakes, but we can offer edible, handmade cake toppers and chocolate vignettes. Contact us for details and to set up a personal consultation. Your Cakettes should last at least a week, longer if you keep them hidden-- I mean, in the fridge. We suggest you store them at or below room temperature, and away from sources of heat. 6. Can I freeze them? Frozen Cakettes are a delicious treat, but be aware that some decoration will become more brittle when frozen, and they may generate condensation when removed from the freezer to thaw. We do not recommend freezing for serving purposes, but in terms of pure flavor there is no reason why not. 7. Do I have to have a theme, or can I just buy them plain? Each flavor has a "classic" decoration which we use for identification purposes-- a carrot on Carrot Cake, a red rose on Red Velvet and so on. No additional theme or flair required! Flavors are all handmade and therefore subject to availability; order ahead to guarantee your favorites! 8. Can I get holiday boxes? Holidays are a great time for Cakettes! For questions about a specific holiday, please contact us, but we make every effort to have multinational options in religious and secular themes.